The characters, known as the Dragonblood Clan, have forged a pact with the Astral Dragon which granted them special new powers.You can choose any one of the Empress, Warrior, Shinobi, or Witch characters to play as. Each playable character has different strengths and abilities! The Empress is a well-balanced DPS character, the Warrior is a Tank class character that protects the party with his high defense, the Shinobi is DPS that places emphasis on movement on tricky attacks, and the Witch can both heal her allies and damage her enemies with powerful spells. Work together with your companions to progress through stages! In Dragon MFD, working together with your companions opens up a whole new realm of exciting possibilities when it comes to defeating enemies and traversing stages. With worldwide matchmaking and in-game communication options for online play, and local co-op players each being able to enjoy their own screen where they are the center of the action, the multiplayer experience is a core element of DMFD. Each player will need their own system and copy of the game to enjoy multiplayer. Carefully drawn pixel art from some of the industry s best pixelmancers paints the entire picture and brings players right into the dark fantasy setting. Absolutely gigantic bosses that are bigger than the entire screen await our heroes. Work together with your comrades to take down these larger than life baddies! Dozens and dozens of hours worth of gameplay! 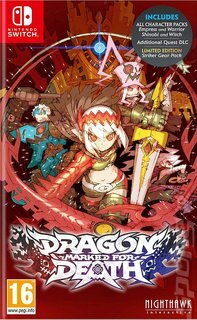 Make no mistake, Dragon MFD is a massive game for its genre. With single stages that span 200-400 screens, over 30 main quests, and tons of side quests to tackle, players have lots of playtime to look forward to!